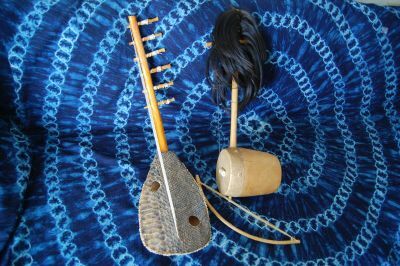 The Mary K. Oyer African Music Archive is a collection of 150 tape recordings that Goshen College Professor Emerita of Music, Dr. Mary K. Oyer, collected during her time in 22 countries in Africa in the 1970s and 1980s. 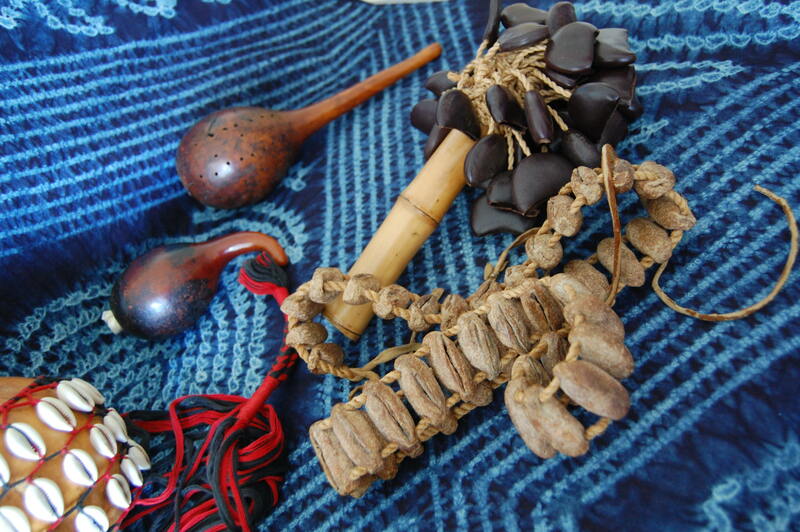 These field recordings have been digitized and catalogued to be more accessible as research tools and for public use. This collection is also a part of the Indiana University Archive of Traditional Music. During the summer of 2012, Lisa Horst Schrock began interviewing Mary K. Oyer about the field recordings and Oyer’s travels in Africa. The result of these interviews can be heard in full as the 96 interviews correspond with Oyer’s field recordings. These interviews are also a part of Indiana University’s Archives of Traditional Music under Lisa Horst Schrock Interview Collection. If you wish to access the database, contact GC Music Department Office Coordinator Dustin George-Miller for a password and further instructions. We encourage you to also search for the database through Indiana University’s Archives of Traditional Music. Made possible through the generous support of: Goshen College, the Goshen College Music Department, Robert Weaver, Robert Brunk, Barry & Marjorie Weaver, William & Joyce Zuercher, and Anonymous. For more information, please contact faculty advisor Dr. Debra Detwiler. This collection emerged gradually as opportunities arose for Mary K. Oyer rather than by a careful plan. 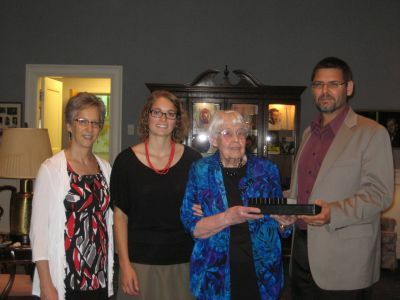 Mary K. Oyer graduated from Goshen College in 1945. She majored in music and took all the art courses Goshen offered at that time. Shortly after graduating, she was invited to join the music faculty at Goshen, with the specific request that she prepare to teach a General Education course integrating the study of music and visual art. The School of Music at the University of Michigan encouraged her to do a M. Mus. in which she would focus on planning such a course. Oyer taught that course at Goshen from 1947 until her retirement in 1987 and also in two places where she taught in her retirement—Anabaptist (Associated) Mennonite Biblical Seminary in Elkhart, Indiana and Tainan Theological College & Seminary in Tainan, Taiwan. 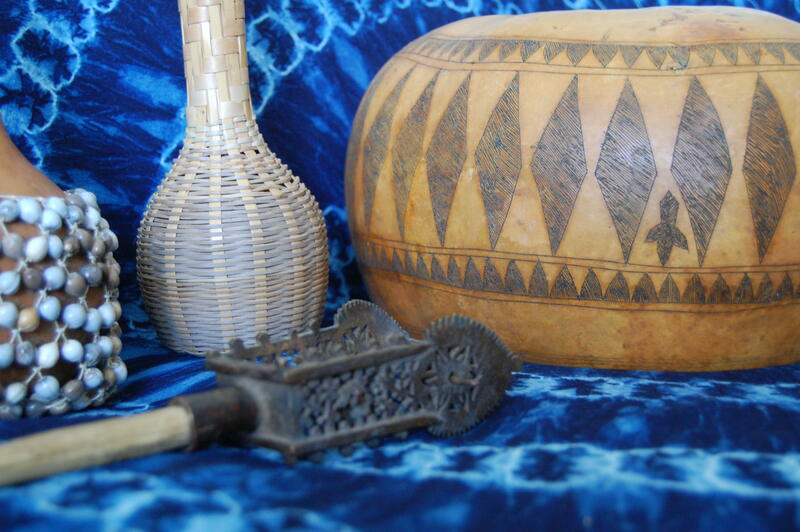 African shakers in the Oyer Music Archive. In the 1950s Oyer returned to the University of Michigan to work on their new degree, a DMA in Performance Practices, with cello as her major instrument, which she completed in 1958. In the 1960s she added compiling a new hymnal for the Mennonite Church (The Mennonite Hymnal,1969) to her teaching assignment. This work included a sabbatical year in Scotland studying with the hymnologist Erik Routley. In this decade, her interest grew in historical, political, social, and cross-cultural aspects of hymnody along with the theological and functional. When in 1968 Goshen College was offered the opportunity to send two faculty members to a US government program for Black Studies operated by faculty of UCLA (Professor John Povey, editor of the African Arts quarterly), Oyer decided to apply and was accepted. It resulted in spending the summer of 1968 at UCLA working on Swahili and a number of preparatory lectures and then travelling to five Sub-Saharan countries, from Senegal to Kenya in the summer of 1969. Oyer had not known whether to focus on music or art during this summer, but decided to include a visit to Uganda on her way home. There she heard Evalisto Muyinda play the endingidi, one-string fiddle. The Kabaka, king of the Bagandans, had been exiled to England in 1966, and his many court musicians were out of work. A few of them played in the Kampala Museum. This is where Oyer recorded her first tape, thanks to her friend’s recorder. Muyinda illustrated the many variations possible with the open string and 4 fingers. He also sold Oyer an endingidi used in the court. By the end of the summer, Oyer knew she wanted to focus on traditional, indigenous music. She saw the enriching possibilities for including cross-cultural music in her related arts courses at Goshen College. She began teaching the African Arts course annually as an alternate course in Goshen’s term abroad program. Oyer returned to Africa often during sabbatical leaves (sometimes expanded to two years) and many summers. Over a 20-year period she visited 22 countries and collected music in most of them. Oyer went at times with grants (to work for Kenya National Archives and Kenya Conservatoire of Music), and a teaching assignment (Kenyatta University). She also worked with Mennonite Central Committee and Peace Corp volunteers in teaching roles, many of whom helped her with local contacts and finding musicians. 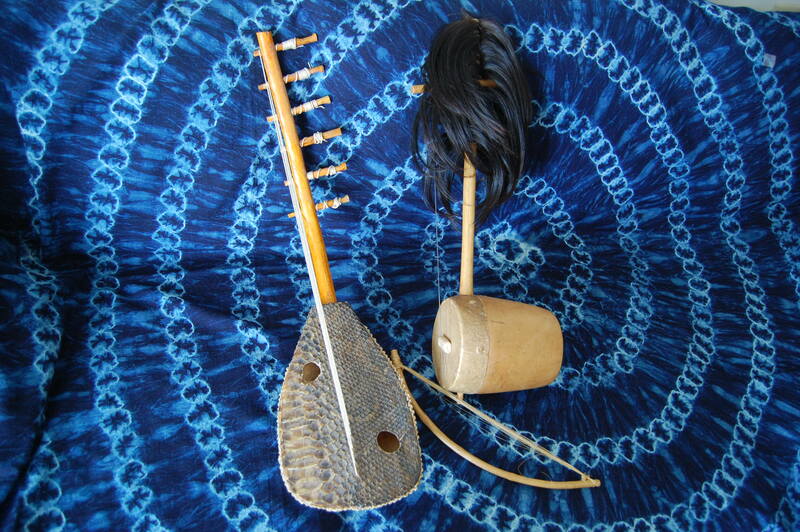 Oyer created deep relationships with many people she met in African and was able to bring several African musicians to the Goshen College campus for the African Arts course–from Uganda, Kenya, and Zimbabwe for two or three weeks and Zambia for two days. Oyer used the tape collection and an increasing number of commercial recordings both in courses at Goshen College and in other teaching venues. She introduced African music to school children in the Goshen, Indiana area (24 groups from third grade to high school in one year at Elkhart). Oyer also lectured at US and Canadian colleges and universities and included cross-cultural music in lectures she gave on hymnology in churches and seminaries. During the summer of 2006, Goshen College Professor Debra Detwiler’s belief in the usefulness of Oyer’s tapes for Goshen College students fueled the beginning of an archive for Oyer’s field recordings. Solomon Fenton-Miller, a 2007 graduate of Goshen College, worked as a Maple Scholar through Goshen College’s summer research program and began digitizing the tapes and creating an outline for an archive of the information found on those recordings. Mary Oyer presents her archive files to Dr. Alan Burdette of Indiana University-Bloomington. Also present: faculty advisor Dr. Debra Detwiler and archivist Lisa Horst Schrock. During the summer of 2012, Lisa Horst (now Lisa Horst Schrock) began working on the archive, also through Goshen College’s Maple Scholars Program. She completed the digitization process for Oyer’s remaining field recordings and interviewed Oyer about her travels and field recordings. These interviews are also part of Indiana University’s Archives of Traditional Music (Search Lisa Horst Schrock for more information). With the support of several generous donors, all alumni from Goshen College, Lisa Horst Schrock continued working and completed the archive during the spring of 2013. The completed archive contains 2327 files that have been digitized and edited from 132 original tape recordings. Each file contains information about the sounds, location, and additional information that can be heard on the recordings.